culture of 2018. The resulting effort is “Trench,” the duo’s most surreal work to date, taking the reader on a journey through 14 tracks dealing with love and the collateral damages of fame. Mutemath frontman Paul Meany is a frequent collaborator, and his influence shows up in spades. The production on “Trench” is more spacious, ripped straight from some retro otherworld. The alien nature of the sliding keys and twinkling synths create an uneasy feeling. “Trench” also leans into the cinematic with beat shifts to give audio cues for changes in emotion across a track, as seen on “Chlorine,” which features a mood-changing outro. Listeners directly engage with Joseph’s isolation, making these moments the most potent on the album. Pitch-shifted vocals return with a vengeance, shaping melodies in the background throughout the record. These voices exist under the main vocal track, lurking as a electronic foil to Joseph. Their inhuman tones feed into the sci-fi production, surrounding Joseph until he is the only human voice in a sea of manufactured sound. The other big change from the band’s previous work is its usage of bass lines. This musical undertone has been used in the band’s other hits “Ride” and “Lane Boy,” but is much more versatile on “Trench.” Creatinga slick groove on “My Blood” or crunching against the drums on “Jumpsuit,” the bass sets the tone for the genre each track flirts with. Joseph and Dun’s genre-bending musicality still dominate as they interpolate reggae, rap, rock and pop throughout the album. 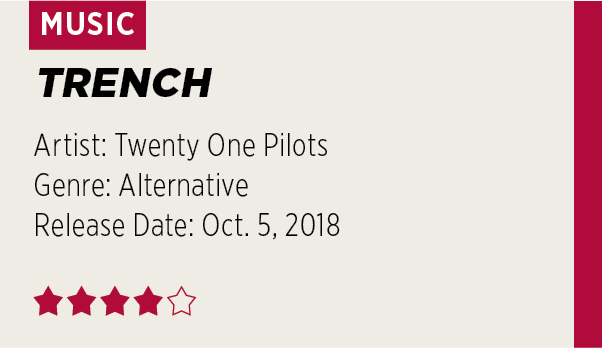 This time around, the songs feel more connected than in previous installments; each track on the duo’s previous LP “Blurryface” is self-contained with its own sound and identity. “Trench” is a cohesive album in which each track is layered on like an ascending spiral staircase. Each offering works on its own, but it builds upon the previous track to elevate the listener onto the next song. The beats flutter and warble in the background to sew each track together into a larger symphonic tapestry. Historically, fans connected with the band for its vulnerable lyrics and mental health messages. However, the band has faced backlash for allegedly romanticizing suicidal thoughts and depression. The duo directly combats this notion on the visceral “Neon Gravestones,” which deals with the treatment of early celebrity death — Joseph contemplates whether he should end it all but instead calls out the culture that stigmatizes and ignores struggling entertainers only to shower them with posthumous laurels after they die too young. “I’m not disrespecting what was left behind / Just pleading that it does not get glorified,” Joseph recites. Piano and drum instrumentals frame the track, building until a choir erupts. With the final verse, the production cuts out almost completely, leaving Joseph to plead with his audience. The fragility in his voice that carries across the track makes it the most vulnerable song and the greatest standout on the album. Other songs on the album prove to be equally entertaining and potent. “Smithereens” is speculated to be about Joseph’s wife, hitting with the mushy charm of a low-budget romantic comedy that works in spite of itself. “Chlorine” starts off simple but breaks into a desperate cry for connection in a barren world. “Bandito” is militant, hammering its catchy hook into listeners’ brains while accompanied by up tempo drums. Ultimately, these widely disparate songs are woven together thematically by Joseph’s insecurities. Joseph doesn’t “Leave The City” on the final song — a space symbolizing depression — but finds the support to help him with his journey. 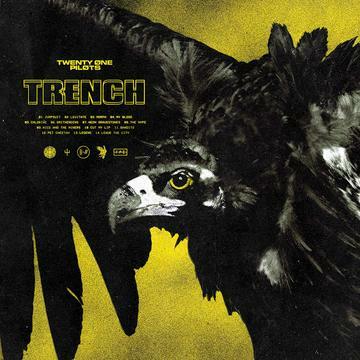 “Trench” proves to be a rewarding listen for longtime fans and casual listeners alike. Twenty One Pilots continues to showcase why it is one of the most idiosyncratic mainstream musical groups out there by pushing boundaries with every project. With its hard lyrical reflection of isolation and suicide, “Trench” may be one of Twenty One Pilots’ best albums to date.